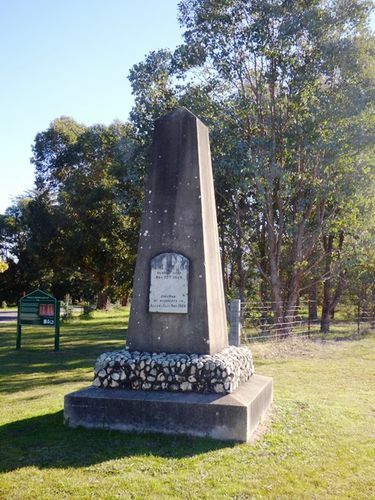 A cairn commemorates the passing through the area of Hume and Hovell in 1824. At the centenary of Hume and Hovell exploration in 1924, a committee was formed to co-ordinate and organise local celebrations along the route from Albury to Corio Bay. An itinerary was created for the unveiling ceremonies giving the hour and date for each place concerned from 15 to 21 November 1924. An exquisite spot was selected for the site of the memorial at Allan's Flat. It is situated at the cross-roads below J. Miller's, and marks the site of the explorers' camp on November 22nd, 1824. The cairn is built of concrete on a six feet square base, and stands 12 feet high. Inset is a marble tablet containing a suitable inscription. On all sides can be seen a vast panorama of hills, plains and bush. To the north is plainly visible the pass through which the explorers` had come; and to the south is the break in the range which was their objective: whilst far off can be seen Mt. Buffalo which the explorers' named several days later. Cr Hodgson welcomed the visitors and gave a brief outline of the route travelled by the explorers' through this district. Mr Gates, Secretary of the Central Committee, spoke on the progress of the nation and the work done by the explorers' and early pioneers', and emphasized the advantages of nationalisation. Mr Hansford, of the Lands Department, gave a brief outline of the route taken by the explorers' from the Murray to the sea. He also gave an interesting description of the difficulties the explorers' had to contend with on the journey. "There could be no more beautiful spot for a memorial than this," said Sir James Barrett as he unveiled the Cairn. He congratulated the local committee on the site selected and the memorial they had built. H. Beardmore, M.L.A., moved a hearty vote of thanks to the visiting and local committees', which was seconded by Mr Greenwood. Light refreshments were then served and fruit and lollies distributed amongst the children, after which all returned home mindful of the deeds of the two great men of 100 years a go. Yackandandah Times (Vic), 21 November 1924.